Want to connect with Rafael? Is your home showing its age and starting to look run down? 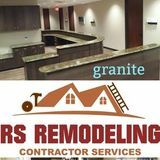 To breathe some new life back into your home or office, contact RS Remodeling Austin. Our remodeling company in Austin, TX, can fulfill a variety of your home remodeling needs as well as commercial renovation and construction. Whether you need some interior or exterior paint refreshed in your office, some plumbing components repaired in your bathroom, or a complete home renovation, we can help. Our years of experience and diversity of projects completed allow us to perform any kind of remodeling project with the utmost professionalism, ensuring your work will be done just the way you request. When you need to improve the value of your home or provide a more modern look to your office, turn to RS Remodeling Austin. Call 512-584-... today for a free estimate.